HA NOI (VNS) — Domestic handicraft exporters would gain 30-50 per cent turnover if they made efficient investments in design and enhancing creativity for meeting the demands and tastes of foreign markets, stated local experts. Vietnamese artworks and handicraft products have been favoured by many overseas markets due to their high quality, said the deputy head of the Ministry of Industry and Trade's Trade Promotion Agency, Ta Hoang Linh. 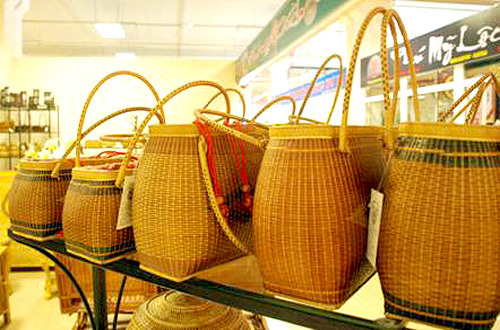 However, poor design remained the biggest weakness of locally-made handicraft products, Linh said, accounting this to a lack of professional designers and inadequate capabilities of those currently working in the industry, who have failed to update themselves at par with the latest trends in the world market. Handicraft producers agreed that creating new handicraft designs, which currently accounted for 30 per cent of the products' value, was an urgent requirement apart from ensuring good quality. It was also not an easy task for them due to insufficient investments and shortage of experience in product development, the firms claimed. Thai Dai Phong, the director of Duc Phong Co, a firm that recorded an annual export turnover of US$1 million, described participating in domestic and overseas training courses and projects on product designs run by ministries, associations, and international trade promotion agencies, as a good opportunity for the handicraft producers to improve their capabilities and keep abreast with the latest trends. Ho Tan Duong, the deputy chairman of the Viet Nam Design Association, said that his group, along with the ADS International Design and Art Centre and Vietrade, were working on a handicraft sustainable development project in collaboration with designers. The association will help the designers in enhancing their corporate relations, customer research, and partnership opportunities. The designers will be provided up-to-date design trends by the local and international experts via design education, training, and workshops.